This May, writer and creator Evan Dorkin’s heroic menagerie of dogs and cats combatting the forces of darkness are back with a new miniseries titled Beasts of Burden: The Presence of Others, with artist Ben Dewey and letterer Nate Piekos helping to bring another tale of the canine and feline do-gooders to life. In Presence, paranormal investigators and their nosy natures could spell trouble for the Beasts of Burden and the town they protect. 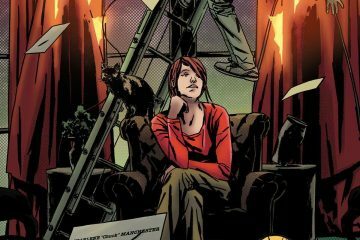 Mr. Dorkin, Mr. Dewey, and Mr. Piekos were kind enough to speak with us about the conceit of Beasts of Burden: The Presence of Others, how the characters of Beasts of Burden have changed over the years, the influences on the Beasts of Burden mythos, and what we can expect to see in the miniseries later on. FreakSugar: Before we get into the new miniseries, for folks who might not be familiar with your previous work, what can you tell us about Beasts of Burden? Evan Dorkin: Beasts of Burden is basically about a group of dogs and cats who defend their sleepy suburban town from the supernatural. Dogs and cats fighting evil. 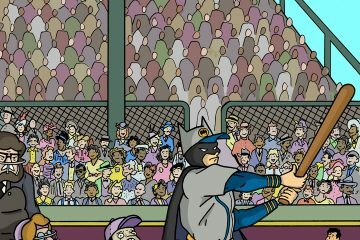 Ben Dewey: With this project it felt important for me to give readers what I think they had good reason to expect: a fun Evan Dorkin script with carefully painted artwork to match. I knew following Jill Thompson on a beloved and award-winning book wouldn’t be easy, but I tried my best to keep the level of quality high and learn something along the way. Now I’ve drawn enough dogs that I can render convincing canines from memory so I picked up that lesson for sure! FS: What is the conceit of this new tale, Beasts of Burden: The Presence of Others? ED: Over the course of the series, a wider occult conspiracy has been growing in the town of Burden Hill. At first there were these seemingly random incidents involving ghosts and monsters, but it’s become clear there’s a reason it’s continuing. Most of the town’s human inhabitants have been blissfully unaware of this, but after a while someone would have to notice that some strange things have been going on. So, this is about what happens after someone calls in a team of paranormal investigators to scope out Burden Hill, and these human ghost hunters meet up with the “beasts”. BD: That is best left up to readers to discover. I think it’s good to avoid giving a synopsis as a review or a preview so people don’t fall into a comparison with their own expectations. 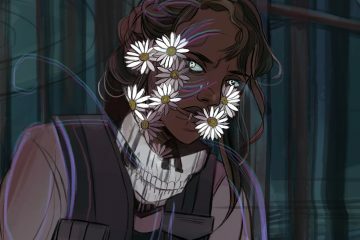 I think it’s more fun for folks to come to it only knowing that there will be magical animals, macabre events and a satisfying ending that is consistently a part of every project I’ve been fortunate enough to work on with Evan. FS: What can you tell us about the main characters, the kids they meet, and the new challenge they face? ED: The main cast is made up of five dogs – Ace the husky, Jack the beagle, Pugsley the Pug (big surprise), Whitey the Jack Russell terrier and Rex the Doberman. There are also two cats, a stray orange tabby called The Orphan, and Dymphna, a former witch’s familiar. And there’s the Swifties, a local street gang of cats led by the Getaway Kid who have thrown in with our heroes. The humans are the Waysides, a team of paranormal investigators. There’s Paul, the father, his son Russell and daughter Sabina. The two groups meet up in a graveyard where some bad things have happened, and more bad things happen. BD: Human and animal characters that appear in this story share common qualities of depth, pathos and clear goals. Good stories come from characters that we can identify with and care about. I think the way in which they interact will be rewarding to people who pick up the book. FS: You’ve been with these characters for a few years now. Have they changed in ways that have surprised you since their first appearance? ED: Sure. None of this was planned, because this was never supposed to be a series. The first story I did with co-creator Jill Thompson was for a Dark Horse anthology in 2003. It was about a haunted doghouse and was supposed to be the end of it, but things tumbled and we kept going. The concept grew in fits and starts, and so did the characters. The characters have become more “wise” about the world they’ve changed. Some drastically, like Ace, who was bitten by a werewolf and got stronger and fiercer as a result. Rex has become less fearful as he connects with the others and values their friendship. Dymphna has done a face turn, she wasn’t part of our plans past trying to kill our heroes with a pack roadkill zombies. Whitey is now questioning his faith as he’s learning more about the cruelties of life. Characters usually develop in unexpected ways as things move forward. BD: I am comparatively new to the books, but I will say that you come to have an affection for these characters over the course of even a single issue because Evan writes them with real dimension and it takes so long to do a painted comic that you have to become friends with them all, and feel invested, or you’ll lose your mind at some point! FS: The art in the first issue is gorgeous and, at times, haunting. The mood set is pitch perfect. 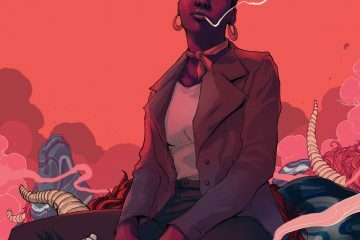 What is the collaboration process like with the three of you following that first issue? ED: I write a pretty detailed script so it’s clear what the story points are that we need to hit. Whatever extra detail and texture I throw in are things that you hope can get put in there, but it’s usually not a huge deal if it doesn’t make it in. At that point it’s largely in the hands of the artist and their process. With Jill we usually wouldn’t see anything until the finished art came in. She’ll drop a line if she wants to make substantial changes to a page, if she wants to break the script up in places, pull a page apart, spread out a sequence, or collapse it, but on the whole, she was on her own. Benjamin and I had never worked together before Wise Dogs and Eldritch Men, so our collaboration on that and Presence has been more straightforward with more steps and notes. I think things are more relaxed as we know what to expect from one another. Ben puts a lot of time into his process—sometimes he’ll turn in multiple versions of a page layout and he does very detailed color studies of his pages before he paints them. BD: I didn’t do the first issue of the Presence miniseries, but I do feel an obligation to keep the same mood and quality consistent. It matters to me the readers feel like I respect their investment in the stories. It can be a complicated back and forth because Evan has very distinct ideas about what he wants to see. I have described him, when asked by other artists, as an exacting but generous collaborator. I’ve never met or talked with Jill, but her work is great and I’ve learned a lot just from looking at the results of her efforts. I have major respect for how much work it takes to have done so many painted comics. It’s like running a marathon on your hands. I’ve done every other type of comics process and hand painting is the toughest. It’s good to be as clear as possible at every stage. 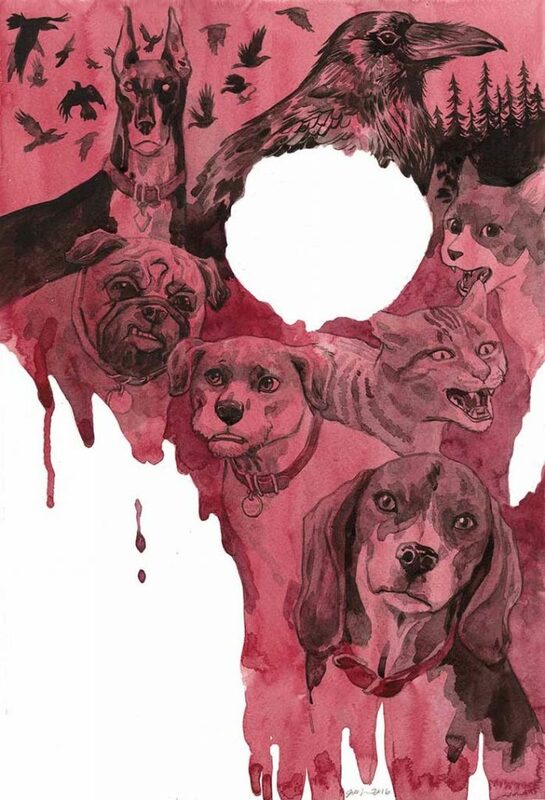 There is an essay on my complete process in the new Beasts of Burden trade Wise Dogs and Eldritch Men. Nate Piekos: Evan’s scripts are incredibly detailed and error-free, so they’re a pleasure to work with, and Ben’s art is, well…look at it. Can it get any better? I just try and complement those two things; uniting them with a lettering style guide that is clean and simple. While we have seen animals as main characters in tale after tale, the Beasts of Burden leads always feel unique in their own right. This goes for all of you: Are there any specific influences that guide you as you create this story? ED: The first story was Watership Down as far as trying to get a sense of the animals’ culture and beliefs. The occult stuff was Poltergeist and The Exorcist. For the series l read a lot of folklore, horror fiction and books about the paranormal, the occult and cryptids. Non-fiction books about dogs, cats, rats. I watch a lot of horror movies, read a lot of horror comics from EC to Junji Ito. Specific influences include the John the Balladeer stories by Manley Wade Wellman, the Cthulhu Mythos and similar weird fiction, and role-playing games like Call of Cthulhu. And I’m sure all the superhero team comics I grew up on are baked into my brain and play into it, The Avengers, The Fantastic Four, The Defenders. BD: I have learned the most about making comics from Steve Lieber. His voice is always in my head. I like a bunch of artists and admire them for a variety of reasons but mostly I just try to tell the story with the same clarity as Mike Mignola, Erica Henderson, Lucy Knisley, Stuart Immonen and Paul Reinwand. Drawing comics is an ongoing and open-ended learning process. NP: I’m not the original letterer, so I’ve tried to take some design cues from previous Beasts series, and carry that forward with a streamlined, organic approach. I’m here to service Ben’s painterly style with lettering that doesn’t compete for attention, but goes hand-in-hand. FS: Every Beasts of Burden yarn is very new reader friendly. How familiar with the previous Beasts of Burden stories does someone need to be when jumping in on this new story? ED: We try to give new readers some sort of grounding with every story and, before Presence, everything we’ve done in the main series has been single stories. There’s a larger storyline building and running through it all, but we set something up and finish it in each one. Presence pulls a lot of past events and incidents together, but there’s a sequence in the opening pages, diary entries written by Sabina Wayside, that clue you in about the town and the situation. BD: As you just stated, Evan crafts the scripts in such a way that it is friendly to new readers and you get a sense of the characters through their choices. It’s a privilege to work on the series. FS: This first issue is incredibly enjoyable and packed with action. What has been your favorite part working on the book? ED: Finishing a script. Seeing the art come in and the stories and characters come to life. That’s when the process seems “real”. I don’t believe it until I see it, the script is like a weird dream I had that I barely remember. Having the book come out is always a thrill. BD: The things I’ve learned over the course of working on the previous Beasts of Burden book and this one are lessons that will stick with me going forward. That should be part of every new endeavor and it has especially been the case for me with this series. NP: Ben’s amazing ability to anthropomorphize a truly enormous range of animals. I love the personalities. FS: Is there anything you can tease about what we can expect to see in the book? ED: Blood, sweat and tears. BD: I got to paint some wild action scenes that required some very gore-heavy reference searches. That’s comics! Beasts of Burden: The Presence of Others debuts Wednesday, May 1st, from Dark Horse Comics.